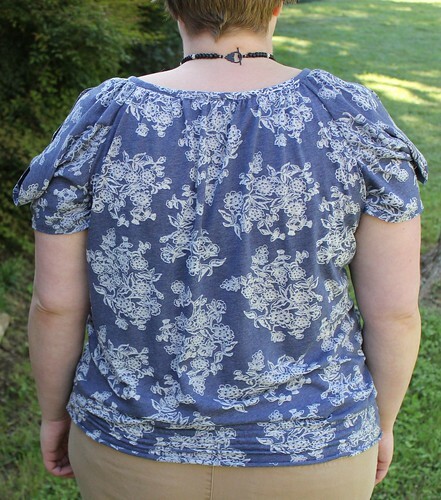 I first made Simplicity 1805 last summer, and despite my complaints that it smacked of PJs, it has been worn several times per month since it was finished. It’s fun, comfortable, and has hand-stitching embellishment. WinWinWin. And naturally, since it worked so well for me the first time I made it, somehow it seems to be one of the few times I’ve made a pattern only once! Time to fix that. This time I wanted to make the cold shoulder version (view F). Calling that style “cold shoulder” makes me chuckle. #1: It sounds really bitchy. #2: If it manages to make my shoulders anywhere in the general vicinity of cold during a Texas summer, I’ll make another 47 of them. 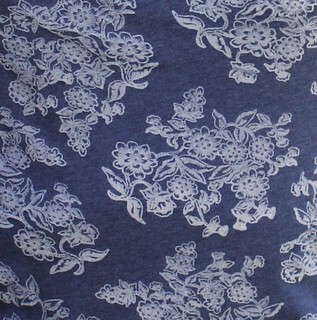 The fabric for this make is a lightweight 100% cotton jersey, and the floral motifs are actually burnout, though fortunately it isn’t too sheer. I bought it locally at The Common Thread, but she’s been sold out of it for a while. 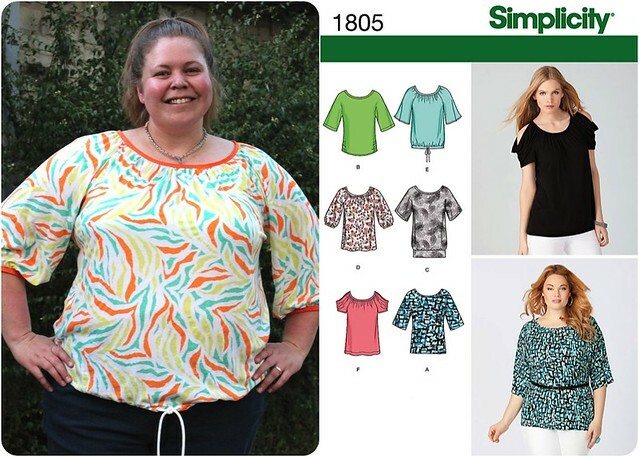 I love it — it’s super soft, the print steps it up a bit from plain t-shirt status, and the weight will be perfect in the heat. A shortcoming of this pattern was the treatment of the cold shoulder facing, or I should say the complete lack of treatment. Basically, they just say to fold it under and press, prior to positioning it to attach to the neckband. Um, no. Thankfully I knew this going in — gotta love pattern reviews — so I had a plan to fix it. I cut strips of fusible webbing the width of the facing and glued it down. So yeah, my t-shirt isn’t heirloom quality. While looking at the aforementioned reviews, I came across a version that I really liked where the sewist used a few rows of shirring at the hem. I blatantly copied it! (Thanks for the inspiration, Diane!) 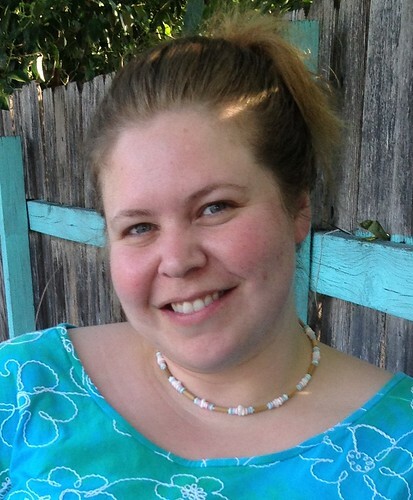 I started about 2″ up from the bottom edge and shirred five rows roughly ½” apart. 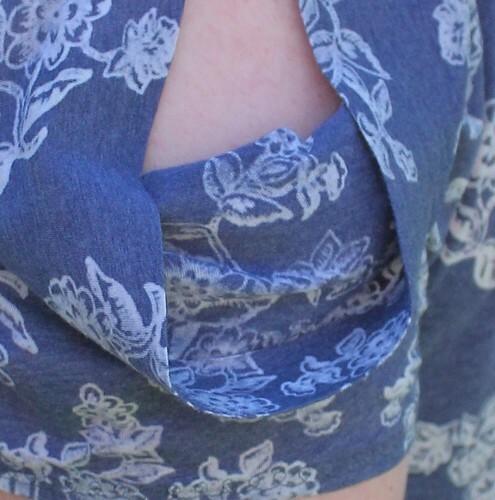 “About” and “roughly” may not be words that I usually embrace when sewing, but it’s shirring on a lightweight knit — I was shooting for presentable, not perfection! I didn’t hem the bottom, and after a wash or two it has created its own nicely rolled hem. :-) I would totally do this treatment again next time, though I typically think shirring looks a little better with more blousing than I left myself, so I might adjust that. As designed, this top has a ton of ease, but I factored that in when I opted not to grade it up, so on me it has far less. In other news… I’m joining MMM’13! This will be my first participation in this type of challenge. Even though I do wear handmade often, I don’t have a whole lot of go-tos, so this may be as much of a laundry challenge as a styling one. ;-) My pics will be mostly phone selfies, because committing to anything other than that will just be a setup for failure! I may post about it weekly or just mid-month and end-of-month, haven’t decided yet. I, Susan of moonthirty.com, sign up as a participant of Me-Made-May ’13. I endeavour to wear 5 me-made items each week for the duration of May 2013. Pretty top! I’m very curious about the fusible web (I’ve never used it before). So it looks like you can wash and dry it and it doesn’t come apart? Love that shirring at the bottom! And yay for doing MMM! I’ve washed this top probably 3 or 4 times already and it’s holding strong. I used Steam-a-Seam 2 Lite, the sheets that come 5 to a package. The instructions say it’s able to be laundered. This is the first time I’ve used it without stitching over to reinforce. I’ll let you know if I start seeing issues with it, but so far so good! Very nice top Susan! Love your simple fix for the strap issue. Good luck with the May challenge too ! Thanks Kim! I think it will definitely be a challenge to come up with somewhat new stuff (styling, etc.) for a month! 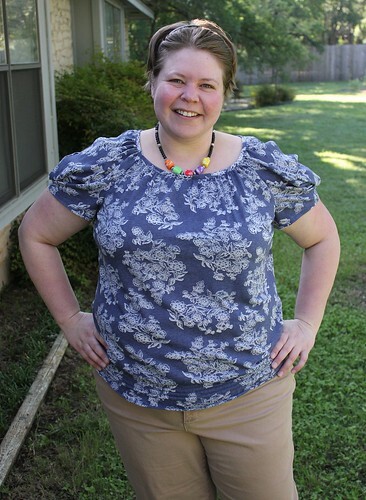 Love your cold shoulder top. Great fabric too. Very nice. Thanks, BeaJay! This was a great fabric indeed — it had to “marinate” in my stash until I found the right use for it! I’m trying to get up the nerve for me made may… maybe??? I love the fabric here. Having lightweight knits for the summer is essential! I really like the gathered neckline, too. I made a t shirt this weekend as well- though its not nearly as fancy. Perhaps I’ll get around to blogging it eventually. ha! 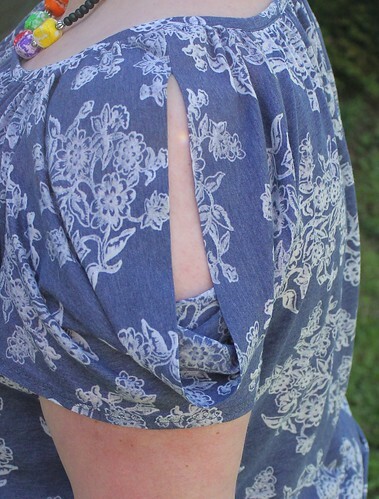 Oh, I like the whole idea of cold shoulders, and as you say, “If it manages to make my shoulders anywhere in the general vicinity of cold during a Texas summer, I’ll make another 47 of them.” I will be right there, sewing along with you! Oh how I love this fabric. And what a cute tee! It looks great!